Need help navigating ARCP earnings? 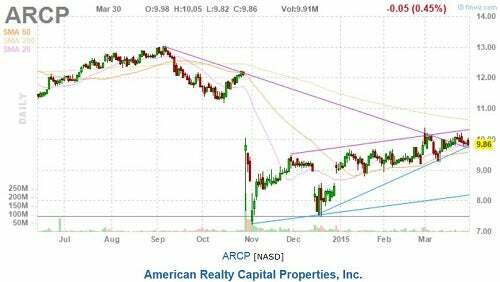 American Realty Capital Properties Inc (NASDAQ: ARCP) on Monday hosted a conference call to discuss the delayed release of its Q4 and FY 2014 results. 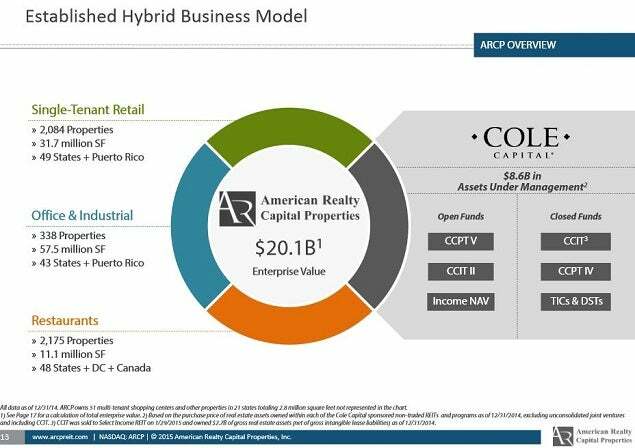 Additionally, ARCP posted a 24 slide presentation of financial highlights and a review of where the business currently stands. 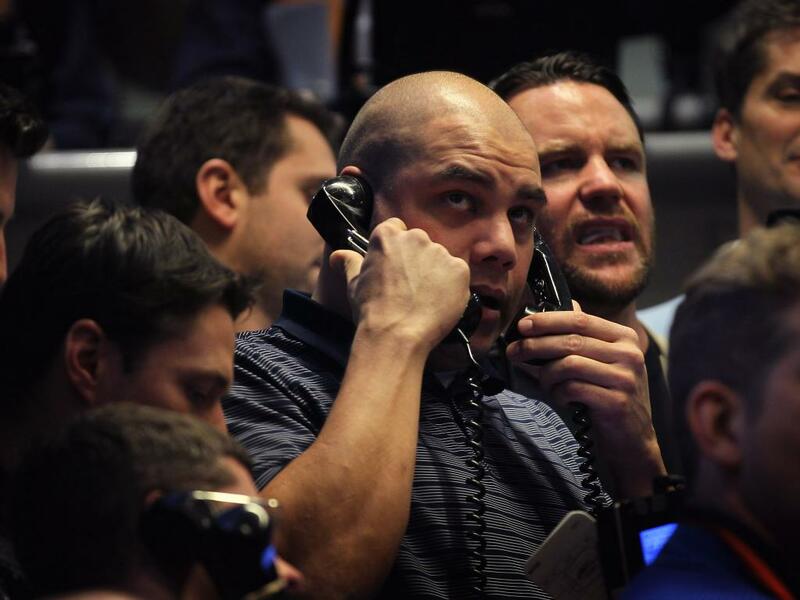 By the end of the trading day on Monday, Mr. Market had an opportunity to digest the numbers and process the information shared on the conference call. 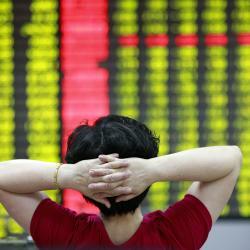 ARCP shares closed almost unchanged, down fractionally from Friday's close of $9.91 per share. Interim CEO Bill Stanley indicated that ARCP will report its Q1 2015 results in May and was now current regarding its SEC periodic financial filings. As of Wednesday (April 1), Glenn Rufrano will officially take over as CEO, and board members Leslie Michelson and former Governor Edward Rendell are to step down from the ARCP board. Recruit two new independent board members; notably, Rufrano will also serve on the board, resulting in a seven-member board. Complete the process to bring on board a new ARCP non-executive chairman. Rebuilding of Cole Capital broker-dealer business; noting the recent hire of Bill Miller to head the sales and national account teams. Continue to implement internal controls. Manage the impact of litigation and governmental investigations. Work with new CEO Rufrano to create a new business plan. Provide 2015 guidance based upon the new plan, which will be unveiled by Rufrano during an ARCP Investor Day presentation. 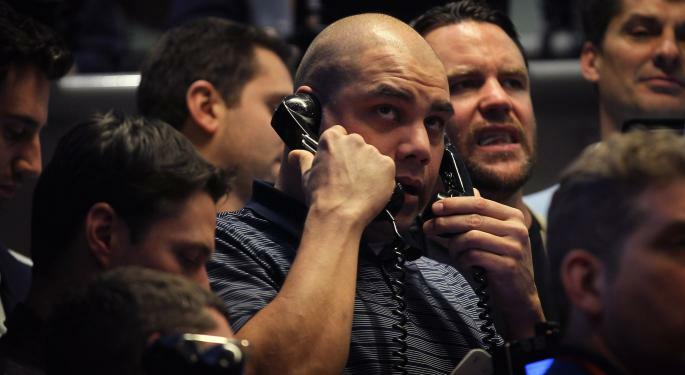 Reinstate a dividend "later in 2015" in line with peers to be paid quarterly. Management reported on the conference call that it had relied on a third-party analysis of Cole Capital in order to arrive at the $406.2 million of impairment charges. 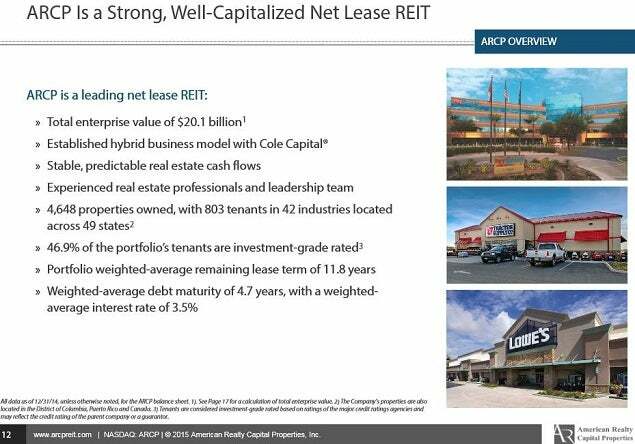 The five office properties owned by Cole Capital are "tenanted but not occupied," with between two to three years weighted average remaining on the leases. 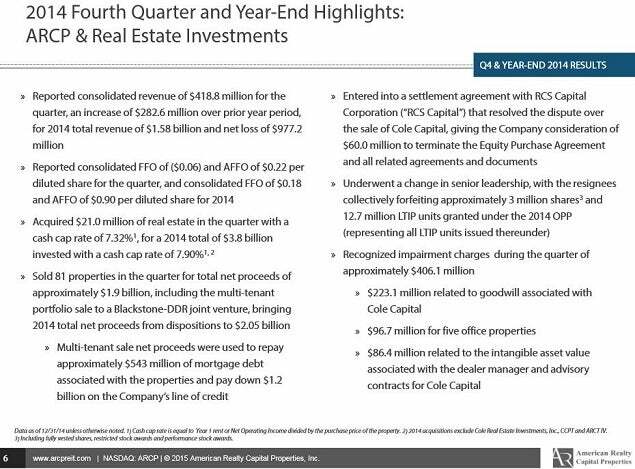 Additionally, the February 24, $183 million sale of the Apollo office building, which houses the Cole Capital corporate headquarters in Phoenix, Arizona, is expected to result in a GAAP loss of $20 million in Q1 2015. 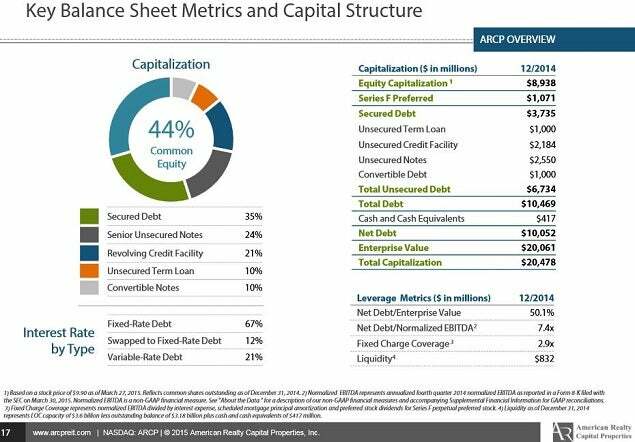 Notably, ARCP's 7.4x net-debt to normalized EBITDA metric is significantly higher than sector peers, (see balance sheet slide 17 below). CCIT was sold to Select Income REIT (NYSE: SIR) on January 29, 2015, and owned $2.7 billion of gross real estate assets. As a result, the current Cole AUM is now at approximately $6 billion. 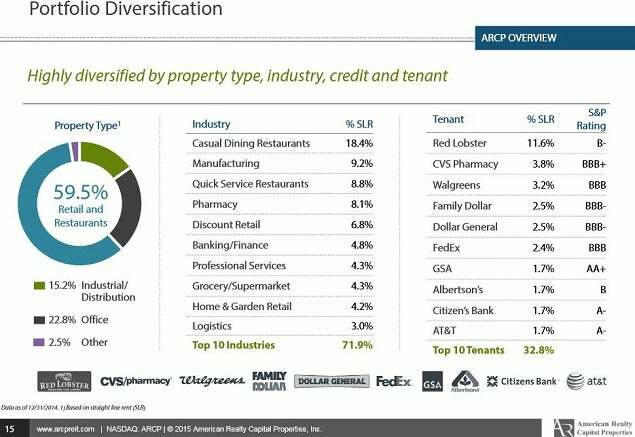 The ARCP acquisition of approximately 500 Red Lobster facilities in early 2014 increased portfolio concentration and reduced the overall portfolio credit profile. One of the challenges facing incoming CEO Rufrano will be to de-lever the ARCP balance sheet.